Parking: Access to this farmers market is quite easy and available on all sides, so whether you are coming from Kailua Road, Hahani St. (Target side), or Hekili St. you can easily enter into the area. Parking for the early birds is best accessed from Hahani St. although this lot is quite small and will fill up quickly it gives you the best access. The market is also partially located underneath (side level) a multi story parking structure that offers parking to the area. Please take your time when entering and leaving this structure as you will pass right along the front area and cross walk. You will also find parking in front of Whole Foods and First Hawaiian Bank. One or two passes and you will usually find something, worst case scenario go across Hahani St. and park at Target. The stalls farthest from Target are the closest to the market and it will take you longer to wait at the light then to actually walk. Restrooms: You have several options regarding restrooms for this farmers market it really depends on you. Onsite at the parking lot are a couple of porta-potties that are clean and well maintained, I have never seen a line so if you need to go quick this is your best option. Otherwise Longs, Whole Foods, and some of the other local establishments all have restrooms open for non-paying customers. If this is your first time venturing to the Kailua Farmers Market you may have also heard it called the Kailua Town Farmers Market, improperly so. 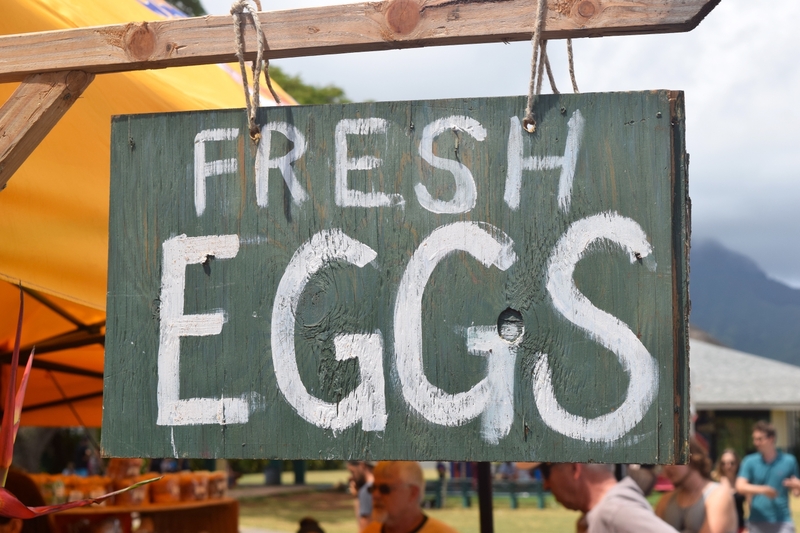 The Kailua Town Farmers Market happens on Sundays and you can get all the details here, Kailua Town Farmers Market. The first thing you will notice when approaching the market is live music and cooked food. If this offends your puritan views of what a farmers market should be then this one is probably not for you. If you enjoy the open market feel with friendly vendors and a slow pace by most of the shoppers then step right up. The feel here is a combination of going out to eat and looking for fresh produce, honestly though, how can you go to a farmers market and not get hungry, right? You will find vendors from the outer islands during some months when crops are yielding higher volumes and they need to move vegetables and fruits before they spoil. Local ranchers also stand tall taking beef orders with custom cut options sure to delight the most picky of eaters. A few booths down the row and you will find Oahu's top vegan restaurant providing samples and information on all they have to offer. If these two can get along, cant we all? If you spend a little time meandering along the two outside rows you will encounter mostly finished foods and of course the live music. On this day it was a solo artist with an acoustic guitar playing some lively tunes and keeping the crowd up beat. Even with the music I could not deny the wonderful smells that were coming from the nearby bbqs, deep fryers, and sizzling woks. I witnessed the cleanest bbq I have ever seen in my life, (short of a new one), cooking up some crispy golden corn that looked scrumptious! Right across I witnessed the slow drizzle of melted butter and herbs slowly covering some of the largest shrimps (prawns) you have ever seen. The pop and sizzle was capped off with some delicious fries being pulled from a steamy hot bath of healthy frying oil, mmmm! I saw, and tasted, a wonderful Lilikoi dessert that I must confess looked somewhat off putting at first glance, agree? Trust me though, its creamy smooth and smart tart just like the fruit. Follow that with a nice cool drink and your ready for some of the other delicious foods that were being prepared on the spot. Take the time to watch the crepes people make something artistic and tasty, appreciate the displays and the time it took to present everything in such a way. Freshly baked bread is always a nice touch to any farmers market and the selection here in Kailua was extensive. One thing I always enjoy about farmers markets are all the handmade signs made up for each vendors goods and goodies. I was able to spend some time watching one vendor write on several "mini-chalkboard" signs as he setup up his booth for the evening. It took him a couple of minuted to do each one, carefully spacing the title and description to fit and choosing a different color for each one. Some of the other signs are large chalkboards with colored chalk messages and prices creatively displayed. The signs, like much of the food, have that handmade feel you just cant mass produce. So in the end you can call it a weekly food festival, farmers market or some combination thereof. It truly seems trivial when you witness all the smiling faces and busy vendors selling goods, talking story, and keeping the Kailua Farmers Market going strong. As with any open market....put trash in its place, no matter how small.